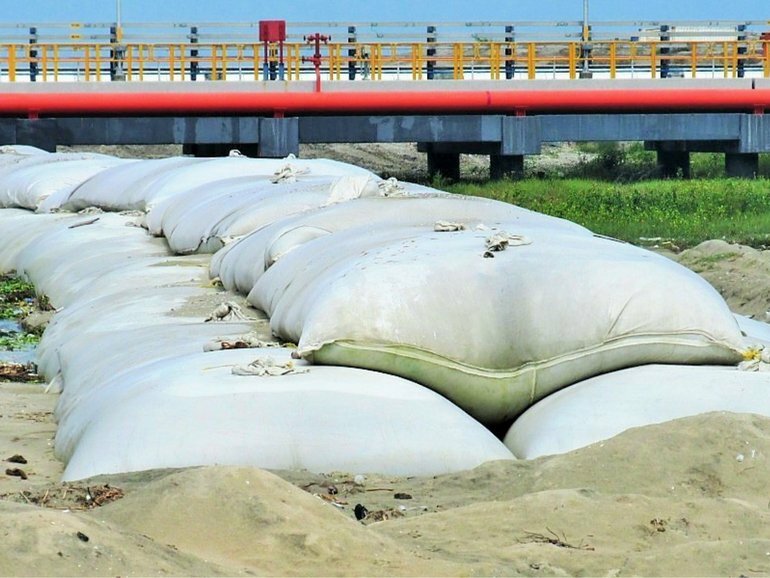 Our solution to address the siltation of the Petronet LNG Ltd terminal in Southern India consisted of a submerged breakwater structure using our geotextile tubes and bags. The Petronet LNG Ltd terminal at Puthuvypeen, Kochi, has a capacity of 5MT p/a to meet the great demand for natural gas power, fertilizers, petrochemicals and various other industries in the Southern states of India. The LNG terminal is in an estuary where the Periyar River flows into the sea. A solution was required to address the accumulation of enormous amounts of silt in the trestle zone. The main objective of the project was to provide a long-term solution for achieving the required utilization at the LNG Jetty, by reducing siltation and to protect the beach from erosion. The scope of work included the construction of a beach protection bund, a groyne and the extension of an existing rubble mound. Our range of geosynthetic MacTubes® were used to build a 500 m long protection bund along the beach toe to address the area of erosion, to replace the eroded volume of beach and also to provide protection for the future. The tubes were filled with pumped slurried sand; the water component drains through the walls of the tube leaving the sand contained within the MacTube®. The beach could then be replenished behind this new protection system. A 150 m long groyne was constructed using MacTube® to trap the silt that was being transported and had accumulated in the trestle zone. The groyne structure was installed approximately perpendicular to the shoreline, and interrupted the movement of silt towards the trestle. For the breakwater structure which extended 500m into the sea, MacTubes® and our geotextile bags MacBags® were installed 1 m underwater near the shore and 3.5 m underwater offshore. The protection bund and onshore groyne were straightforward to install due to their location. However, the breakwater structure was in the wave breaking zone, complicating the installation. An experienced team of four divers worked at the change of the tides to install the geotextile tubes with the aid of a hydraulic pumping system. This limited the time available for construction. The project was completed successfully. The solution was proved to be versatile and flexible in nature. Currently, reduced levels of siltation can be observed and vegetation has established on the geotextile tubes.